A member of iRobot’s latest generation of domestic robots, the Roomba 560 is built with their latest innovations for improved performance, reliability and durability. On-board scheduling allows you to preset up to seven cleaning times per week when it’s most convenient for you. Roomba 560 will clean four rooms on a single charge, getting into hard to reach areas next to walls and beneath furniture. It can even avoid stairs and ledges without you telling it where they are, and adjusts from hard floors to carpets – it’s such a smart little robot! Virtual walls (2 included) can confine Roomba 560 to a pattern you select, and even select different patterns on different days! It even automatically returns to its home charging station when it’s done! An improved design over earlier models picks up more hair, dust and debris than ever before, and the improved brushes are easier to remove and clean. Roomba 560 is ready to clean up your house! Welcome to the future! 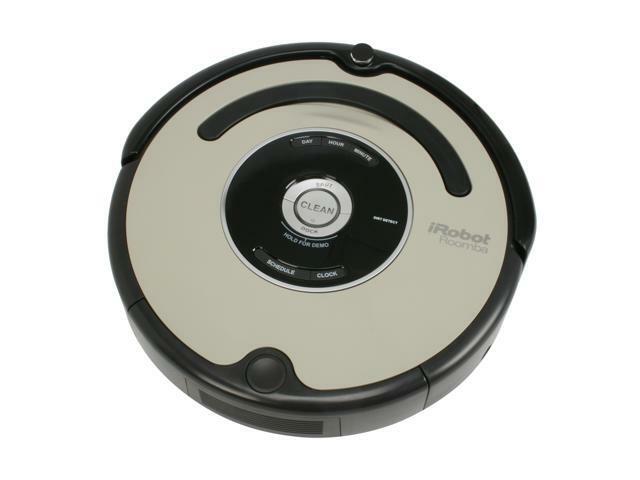 Highly Efficient Cleaning Combining improved counter-rotating brushes and redesigned filters with spot clean and dirty area detection, the iRobot Roomba 560 provides highly efficient cleaning of tiny dirt, dust and hairs whether on the floor, carpet, around furniture or along walls. Intelligence The intelligent Roomba 560 automatically senses and avoids stairs and other drop-offs, self-adjusts for carpets and hard floors and returns to its Home Base to dock and recharge itself between cleaning cycles. Just press the Clean button letting the Roomba does the rest! 20.5" x 17" x 6"
Cons: This model have a lot of issue on motor. And refurbished one might make the case worst. It work for 7 month, and right drive wheel stop working. base on my google search, the result is cause by defect H bridge (chip to control motor). So i will not suggest getting a refurbished one. Cons: Me : My Roomba 560 won't work on my black carpet. iRobot Rep : Yes - that's a feature called the cliff sensor , when the sensor sees a dark color it believes it's about to go over a cliff and stops - Just in time ! Me : So, you have a 'feature' that tells your unit that my black carpet is a cliff ? Me: In my business we call that a bug. Pros: Automatic operation, simple to set up and use. There's something to be said for having a machine that does a boring, drudge of a task like vacuuming. The house does stay cleaner. Cons: Poor design and material choices, high maintenance, noise. In operation, Roomba is noisy, not only with its cheerful beeps but fan whines, brush noise, etc. Maybe no louder than a traditional vacuum but a traditional vacuum doesn't run for hours at a time. If you are home all day, whether working from home, retired or raising a family, this will eventually get on your nerves. After living with the Roomba 560 for several years, I finally gave up. The time saved by automatic vacuuming is lost with the amount of time it takes to keep the silly thing clean. In a home with pets, the pet hair destroys the brush mechanism and the smallish air filters clog easily. After every use, I had to swap the filter (I bought a spare so I could wash one while using the other) and spend 15 -20 minutes unwinding pet hair from the brush unit. Even with religious servicing, hairs would find their way into the clockwork gearbox that drives the brushes, wrapping around the turning bits. This, in turn, caused the plastic gears and housing to heat up, melt and necessitate full replacement of the gear/brush unit. The first was replaced under warranty; others carried a high out of pocket cost. A search of the internet found DIY solutions that replaced bushings with sealed bearings to eliminate the problem. IMO, this is a fundamental design flaw that has never been successfully addressed by the manufacturer. Why would they? The replacement parts are a great ongoing revenue stream. In the end, our Roomba went to the closet and ultimately to an electronics recycler. iRobot was the first to address the issues of logic and operation; their robotics skills are not in question. At the end of the day, though, a robot vacuum must function as a vacuum, not just a robot; in this, Roomba is lacking. Other Thoughts: I still like the *idea* of a robot vacuum. I may check out Miele, Dyson and even Neato, but I'll pass on iRobot products from here on out. Pros: does what it is supposed to. Picks up dog hair very well. Great Price on sale. Pros: - Vacuums my twin-sized home's first floor without running out of power, and automatically returns to the dock to charge when done. Cons: - Supposed to clean dust bin and brushes after every use, but that's typical of every vacuum if you actually read the manual. Other Thoughts: Don't watch it clean. It might seem like it's going in illogical directions and it will bother you, but trust me - it will get the whole floor. I highly recommend scheduling cleaning for when no one's in the house for an hour or two, depending on the size of the rooms being cleaned. Got it for $189 on sale, WORTH. EVERY. SINGLE. PENNY. Like any vacuum, regular maintenance will keep this bot functioning properly. Pros: This thing came in today. I was scared at first on spending money on this thing. But Wow did it deliver. I let it do a full run on my floors, it picked up almost a full tray in one run, which is scary because i keep my house pretty clean and the garbage tray is a decent big size. Cons: The Roomba came with a broken front wall brush thing. Not sure if it was because it was a refurb and they missed it or what. Its not enough of a problem to take off an egg. Just hope those brushes are cheap lol. Pros: Can easily be programmed to run on a schedule. Cleans better than I expected. Gets under beds and dressers where we normally wouldn't get to everyday! Great for pets and hardwood floors. Cons: Noisier than expected. Doesn't always find its way home and sometimes gets stuck trying to eat a barbie or and doll with long hair. Other Thoughts: I schedule it to run when I'm at work so the noise won't bother me. And I guess it is a vacuum so its supposed to be noisy. I've had it for about 2 years now and its still going strong. It doesn't get everywhere inch of floor on a single day but I run it 5 days a week so it does a good job. I have a cat so under beds can get hairy but since I've had the Roomba, no more cat tumbleweeds blowing around. You still need to vacuum steps and high traffic rugs to deep clean, just not as often.